Juliana pieces by Delizza and Elster (D&E) are always spectacular and this brooch is a showstopper even for them. The brooch is a very large size and features heavy tiered construction which gives lots of dimension. 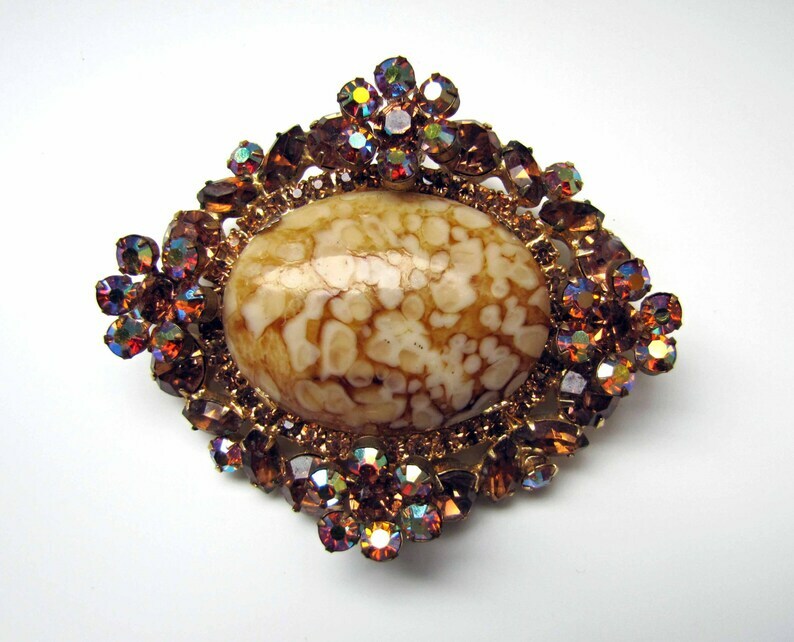 The center of the brooch features a large egg shaped Italian art glass cabochon that is surrounded by an overload of round chaton and marquis cut glass crystals. The stones are rich shades of amber and topaz brown and they have an iridescent aurora borealis finish. An absolute beauty, impressive and highly collectible! 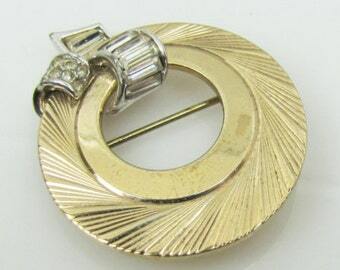 This is a verified Juliana piece and this particular model features on the Delizza and Elster research site where it has been used as an example of how to recognize a true "Juliana" brooch. The Juliana range of costume jewelry was a limited run manufactured by the Delizza and Elster company, USA during the 1960s. It was never signed being originally sold with hang tags that read “Juliana Original”. The entire range which includes many magnificent and over the top pieces is superb quality and has gained a passionate following from costume jewelry enthusiasts who have extensively researched and identified the original range of Juliana pieces. Condition is excellent with absolutely no flaws. The brooch measures 3 inches wide by 2-3/8 high (approx. 75x50mm) and it weighs 45 grams. 1960s Turtle Brooch by Juliana, Delizza And Elster, USA. Amber/Topaz Crystal Rhinestone Figural Pin. Collectible American Costume Jewelry. Delizza And Elster D&E Brooch Earring Set. Juliana Sapphire Blue Art Glass, Crystal Rhinestone Diamante Jewelry. Vintage 1960s Designer. D&E Juliana Bracelet. Delizza and Elster Rhinestone Jewelry. Silver Smokey Gray Clear Crystals. D and E Cha Cha Bracelet. Vintage 1950s WEISS Gold & Shocking Pink Rhinestone Diamante Brooch. Large Marquise Pink Brooch. Vintage Haute Couture Diamante Rose Brooch. Huge Gold Crystal Rhinestone Flower Brooch, Shoulder Corsage. Designer Runway Statement Jewelry. Vintage 1980s CINER Gold & Ruby Red Rhinestone Statement Brooch. Sunflower, Daisy, Triple Flower Corsage Brooch. Designer Costume Jewelry. Weiss Siam Red Rhinestone Gold Mesh Earrings & Brooch Set. 1950s Vintage Designer Costume Jewelry. Aurora Borealis Crystals. Tiered Setting.